Raymond Philip Asaph is a Long Islander who writes both poetry and fiction. His poems have appeared in Poetry; his fiction will appear in Glimmer Train. He’s currently completing a novel about America through the eyes of a furniture mover called Brothers of the Ox. Stan Badgett and his wife live in the mountains of western Colorado, where they raised four children. He worked in the coal mines before becoming an English teacher. Now he is retired. His poems have appeared in numerous journals. C. Dylan Bassett’s work has appeared in The Portland Review, The Monarch Review and Inscape. David Blair’s first book Ascension Days was chosen by Thomas Lux for the Del Sol Poetry Prize. He teaches at the New England Institute of Art in Brookline, Massachusetts. Partridge Boswell’s first book of poems, Some Far Country, received the 2012 Grolier Discovery Award. Founder of Bookstock: The Green Mountain Festival of Words and managing editor of Harbor Mountain Press based in White River Junction, he lives with his family in Woodstock, Vermont. Michael Brokos is a graduate of the Poetry MFA program at Boston University and a recent attendee of the Bread Loaf Writers’ Conference on a work-​​study scholarship. He lives in Portland, OR. Betty Buchsbaum is the author of the “The Love Word” a volume of poems. Her work is found in anthologies (most recently“When Last On The Mountain”), also in journals that include “Prairie Schooner“and “Women’s Review of Books.” She is Professor Emerita at Mass. College of Art. Sarah Burke is an MFA candidate in creative writing and environment at Iowa State University. Her poems are published or forthcoming in Cimarron Review, Copper Nickel, Green Mountains Review, Passages North, and Silk Road. Jenn Chan Lyman is a fiction and non-​​fiction writer based in Shanghai. She rewires her brain from finance to writing on a daily basis, resulting in the occasional fractured psyche, and recently graduated from City University of Hong Kong’s MFA program. Brian Culhane’s poems have recently appeared or will shortly appear in Slate, PN Review (UK), Sewanee Review, Literary Imagination, Plume, Southwest Review, Memorious, and Parnassus. His first book, The King’s Question (Graywolf) was awarded the Poetry Foundation’s Emily Dickinson Prize. He teaches at an independent school in Seattle. Adam Day’s work has appeared or is forthcoming in the American Poetry Review, Guernica, Kenyon Review, Gulf Coast, Indiana Review, and Antioch Review, among others, and has been included in the anthology Best New Poets 2008. A graduate of Pacific University’s MFA program, Jaydn DeWald lives with his wife in San Francisco, where he writes, plays bass for the DeWald/​Taylor Quintet, and serves as Senior Poetry Editor for Silk Road. His work has appeared or is forthcoming in Bellevue Literary Review, Columbia Poetry Review, The National Poetry Review, West Branch, Witness, and many others. Dana Diehl is currently an MFA candidate in fiction at Arizona State University. She received her B.A. in Creative Writing at Susquehanna University. Susan Donnelly’s latest collection is Capture the Flag. Author of Eve Names the Animals, Transit and three chapbooks, she has published in The New Yorker, The Atlantic Monthly, Poetry and many other journals. She lives, writes and teaches poetry in Cambridge, Massachusetts. Gary Dop grew up throughout Germany and the United States. He’s a poet, actor, scriptwriter, director and the Writer in Residence at North Central University in Minneapolis. His first book of poems, Father, Child, Water is forthcoming from Red Hen Press. Wendy Drexler’s first book-​​length collection, Western Motel, was published in April 2012 by Turning Point. Her poems have recently appeared or are forthcoming in Barrow Street, Blood Orange Review, Cider Press Review, Mid-​​American Review, Off the Coast, and other journals. Twice nominated for a Pushcart Prize, Wendy is a poetry editor for Sanctuary magazine. Amy Dryansky’s first book, How I Got Lost So Close To Home, was published by Alice James Books and her second, Grass Whistle, is forthcoming from Salmon Poetry in 2013. Her poems appear in a variety of publications, and she was awarded a Massachusetts Cultural Council Poetry Fellowship in 2012. Valerie Duff-​​Strautmann is the author of To the New World (Salmon Poetry). She is the poetry editor of Salamander and works as a freelance writer and editor. Reviews and poems have appeared recently or are forthcoming in the Boston Globe, The Journal, TheCommonOnline, Gulf Coast online, and Poetry Northeast. Alan Feldman has been writing about his family’s life for more than fifty years, beginning with The Household (Columbia Review Press, 1966), and continuing with The Happy Genius (SUN, 1978), which won the Elliston Book Award, and most recently with A Sail to Great Island (University of Wisconsin Press, 2004), which won the Pollak Prize. Mary Jo Firth Gillett’s full-​​length collection, Soluble Fish, won the Crab Orchard Series First Book Award. She’s also won a NY Open Voice Award, a 2012 Kresge Artist Fellowship, and has published three award-​​winning chapbooks. Her poems have appeared in The Southern Review, Green Mountains Review, Harvard Review, Third Coast, and elsewhere. Amorak Huey recently left the newspaper business after 15 years as an editor and reporter. He teaches writing at Grand Valley State University in Michigan, and his poems have appeared The Best American Poetry 2012, The Southern Review, Subtropics and other journals. Michael Jenkins is a homemaker and part-​​time psychometrics technician whose poems have appeared in Shenandoah, Georgetown Review, Harpur Palate and forthcoming in Cave Wall. Betsy Johnson-​​Miller lives in Minnesota. Her second collection of poems, Fierce This Falling, was published by Mayapple Press in the fall of 2012. Jacqueline Kolosov’s third poetry collection is Memory of Blue (Salmon Poetry, 2013). Her poetry and prose have recently appeared in Bellevue Literary Review, The Southern Review, and Cimarron Review. She is Professor of English at Texas Tech University. Matthew Landrum holds an MFA from Bennington College. His poems and translations have recently appeared in Southern Humanities Review, Memoir Journal, and Bluestem. Gregory Lawless is a graduate of the Iowa Writers’ Workshop and the author of I Thought I Was New Here (2009). His poems have appeared or are forthcoming in the National Poetry Review, Zoland Poetry, Sonora Review, the South Dakota Review, Artifice, Gulf Stream, Third Coast, The Journal, Pleiades, and many others. Diane LeBlanc is the author of two poetry chapbooks: Dancer with Good Sow (Finishing Line Press, 2008) and Hope in Zone Four (Talent House Press, 1998). Diane directs the writing program and teaches at St. Olaf College in Northfield, Minnesota. Matthew Mahaney was born in one place, grew up in another, and has since lived in several more. He currently lives in Tuscaloosa, where he teaches at the University of Alabama. His writing appears recently or is forthcoming in Barn Owl Review, Gigantic Sequins, Gulf Coast, ILK, The Journal, and NAP. Sally Wen Mao teaches writing at Cornell University. Her first manuscript has been a finalist for Tupelo’s 1st/​2nd Book Prize and the Four Way Books Intro Prize in Poetry. 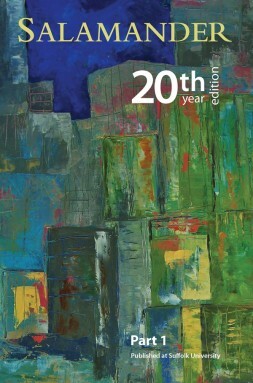 Recent work can be found in Gulf Coast, Indiana Review, Passages North, Quarterly West, and West Branch, among others. Fred Marchant is the author of four books of poetry, the most recent of which is The Looking House (Graywolf Press, 2009). Director of the Creative Writing Program and Co-​​Director of the Poetry Center at Suffolk University, he is also the editor of Another World Instead: The Early Poems of William Stafford, 1937–1947 (Graywolf Press, 2008). Mary Ann Mayer’s poems, essays, and translations have appeared most recently in The Providence Sunday Journal, South County Living, Wild Apples: A Journal of Nature, Art & Inquiry; and Trans-​​Lit 2. She was a finalist in Tupelo Press’s 2012 Winter Poetry Contest. In 2010, she won Boston’s Grub Street Center’s poetry award and was a finalist in the River Styx International Poetry contest. She is the author of one book of poems, Telephone Man (2005). Mary Ann lives with her husband and dog, Ezra Hound, in southeastern MA. She is a member of the Origami Poetry Project and the outreach organization, The Ocean State Poets. She is an occupational therapist. Sjohnna McCray teaches English at Savannah State University. His poems have appeared in The Evergreen Review, Brilliant Corners, Valparaiso Poetry Review, Gargoyle Magazine. and The African American Review. He earned his MFA from the University of Virginia. Christopher Lee Miles’s work appears in War, Literature & the Arts, Sugarhouse Review, and Atlanta Review. He lives in Fairbanks, AK. Matthew Minicucci’s chapbook Reliquary is forthcoming in January 2013 from Accents Publishing. His work has appeared in or is forthcoming from numerous journals, including: The Gettysburg Review, The Southern Review, The Literary Review, Mid-​​American Review, Hayden’s Ferry Review, Cream City Review, and Crazyhorse, among others. He has also been featured on Verse Daily. He currently teaches writing at Millikin University in Decatur, IL. Andrea Moorhead was born in Buffalo, New York, in 1947. Editor of Osiris and translator of contemporary Francophone poetry, Moorhead publishes in French and in English. Translations include Night Watch (Red Dragonfly Press 2009; Abderrahmane Djelfaoui) and Dream Stone (Guernica Editions 2010; Madeleine Gagnon). Benjamin Myers is the author of Lapse Americana (New York Quarterly Books, 2013) and Elegy for Trains (winner of the 2011 Oklahoma Book Award for Poetry). His recent poems may be read in Devil’s Lake, DMQ, Nimrod, Tar River, The New York Quarterly, and elsewhere. Yehoshua November is the author of God’s Optimism, which was named a finalist for the L.A. Times Book Prize in Poetry. His work has appeared in The Sun Magazine, Prairie Schooner, Virginia Quarterly Review, and on The Writer’s Almanac. He teaches writing at Rutgers University and Touro College. Jennifer O’Grady is a poet and playwright. Her book of poetry, White, won the Mid-​​List Press First Series Award. Her poems have appeared most recently in Southwest Review, Poetry Daily, and Garrison Keillor’s “The Writer’s Almanac.” She lives with her family near New York City. Lynne Butler Oaks holds an MFA in Creative Writing from the University of Utah. She was the winner of the 1993 H.E. Francis Fiction Prize, the Utah Arts Council Fiction Competition, and has been published in The Quarterly, The Missouri Review, Fiction International, and the Prize Editions of The Mississippi Review and Nimrod, among others. Ricardo Pau-​​Llosa has published six books of poetry, the last four with Carnegie Mellon. A seventh is in preparation. He has new work in Poetry, Stand, American Poetry Review, Beloit Poetry Journal, The Fiddlehead, Epoch and other magazines. Dan Pinkerton lives in Des Moines, Iowa. His stories have appeared in Cimarron Review, Crazyhorse, Arts & Letters, Washington Square, Quarterly West, and the 2008 Best New American Voices anthology. New work is forthcoming in Spittoon, Superstition Review, and Old Flame: From the First 10 Years of 32 Poems Magazine. Lana Rakhman has current poems published or forthcoming in New Madrid, RHINO, Poetry Quarterly, Harpur Palate, 5th Wednesday, Otis Nebula, Grey Sparrow Journal, Main Street Rag, Rougarou, and others. She teaches college English, and lives in Chicago with her husband and unruly cat, Pretzel. Joanne DeSimone Reynolds is working on a chapbook about mothering, daughtering, and the undercurrents of grief. She is a graduate of Boston University and studied poetry at Lesley University and in workshop with Tom Daley. She lives in Wellesley, Massachusetts. Wesley Rothman serves as an assistant poetry editor for Narrative and senior poetry reader for Ploughshares. A recent finalist for the 49th Parallel and McCabe Poetry Prizes, his poems and reviews have appeared or are forthcoming in The Bellingham Review, Salamander, Ruminate, Newcity, and The Critical Flame. He teaches writing at Emerson College and the University of Massachusetts, Boston. Lynne Sharon Schwartz’s latest novel is Two-​​Part Inventions, just published by Counterpoint. Other recent works include See You in the Dark, a collection of poems; the memoir Not Now, Voyager; and the novel, The Writing on the Wall. She teaches at the Bennington Writing Seminars and the MFA program at Columbia University. Brittney Scott received her MFA from Hollins University. Her poems have appeared or are forthcoming internationally in such journals as Crab Orchard Review, Poet Lore, The Malahat Review, Water~Stone Review, Salamander, Stand Magazine, The Journal, Folio, Copper Nickel, Basalt, KNOCK, Jabberwock Review, and Quiddity. She is a book reviewer for the Los Angeles Review and a poetry reader for Blackbird. Laurie Sewall’s poems appear or are forthcoming in Folio, Peregrine, The Pinch, Poet Lore, and Soundings East, among other publications. Her poetry was selected as a finalist in the Atlanta Review 2011 International Poetry Contest. She writes and teaches poetry in rural Iowa. Tom Sexton’s most recent books are Bridge Street at Dusk, Loom Press 2012 and I Think Again of Those Ancient Chinese Poets, University of Alaska Press 2011. He is a former poet laureate of Alaska and has lived in Anchorage with his wife, Sharyn, since 1970. Hilary Sideris’s chapbook Gold & Other Fish is forthcoming from Finishing Line Press. She lives in Brooklyn and works as a staff developer for the City University of New York. Brian Simoneau’s poems have appeared or are forthcoming in Boulevard, Cave Wall, The Collagist, Crab Orchard Review, DIAGRAM, The Georgia Review, North American Review, and other journals. Originally from Lowell, Massachusetts, he lives in Boston with his wife and their two young daughters. Joseph Spece holds fellowships from the Poetry Foundation and the MacDowell Colony. His first book of poems, Roads (Cherry Grove), is forthcoming in March, 2013. Marcela Sulak is the author of two collections of poetry, Immigrant (2010) and the chapbook Of all the things that don’t exist, I love you best. Current work is forthcoming in such journals as Fence, Black Warrior Review, Cimarron Review, New Letters and The Iowa Reveiw. She’s translated three collections of poetry from the Czech and the French and directs the Shaindy Rudoff Graduate Program in Creative Writing at Bar-​​Ilan University. David Thacker’s poems have appeared or are forthcoming in Ploughshares, Subtropics, The Cortland Review, Nimrod, Sycamore Review, and elsewhere. He teaches writing at the University of Idaho. Lee Colin Thomas is the recipient of a 2010 Loft Mentor Series award. His poems have appeared in Flurry, The Q Review, and Poet Lore. He lives in Minneapolis. Kim Triedman’s work has been widely published and has won and placed in more than a dozen national poetry and fiction competitions. She is the author of “bathe in it or sleep” (Main Street Rag Press) and editor of Poets for Haiti: An Anthology of Poetry and Art (Yileen Press). Two new books – Plum(b) (poetry) and The Other Room (fiction) – are due out in 2013. Chelsea Wagenaar is a doctoral fellow at the University of North Texas in Denton, Texas, where she lives with her husband, poet Mark Wagenaar. Her poems have appeared or been accepted recently at Ninth Letter, Barrow Street, and The Greensboro Review. She is the 2012 winner of the Pablo Neruda Prize for Poetry through Nimrod International Journal. Originally from Louisiana, Anna Lowe Weber currently lives in Huntsville, Alabama, where she teaches creative writing and composition at the University of Alabama in Huntsville. Her work has appeared or is forthcoming in The Florida Review, Iowa Review, Rattle, and Ninth Letter, among others. Leslie Williams’ first book, Success of the Seed Plants, won the 2010 Bellday Prize for Poetry and was a finalist for the Eric Hoffer Award. Her work has appeared in Salamander, Poetry, Southern Review, Slate, Shenandoah and in many other magazines. She is a recipient of the Robert H. Winner Award from the Poetry Society of America and grants in poetry from the Massachusetts Cultural Council and the Illinois Arts Council. P. J. Williams is an MFA candidate at The University of Alabama. Before beginning his studies in Tuscaloosa, he taught high school English for three years in North Carolina. His work has appeared in Cartographer, Mixed Fruit, PANK, and others. Lori Wilson received her MFA in poetry from Drew University and is the author of a poetry collection, House Where a Woman (Autumn House Press, 2009). Her poems and reviews have also appeared in Women’s Review of Books, Southern Poetry Review, Kestrel, Georgetown Review, 5 AM, and elsewhere. She lives in Morgantown, WV. Scott Withiam’s poems have recently appeared in Agni, Ascent, Beloit Poetry Journal, Boston Review, Cimarron Review, Linebreak, The Literary Review, Ploughshares, and Tar River Poetry.